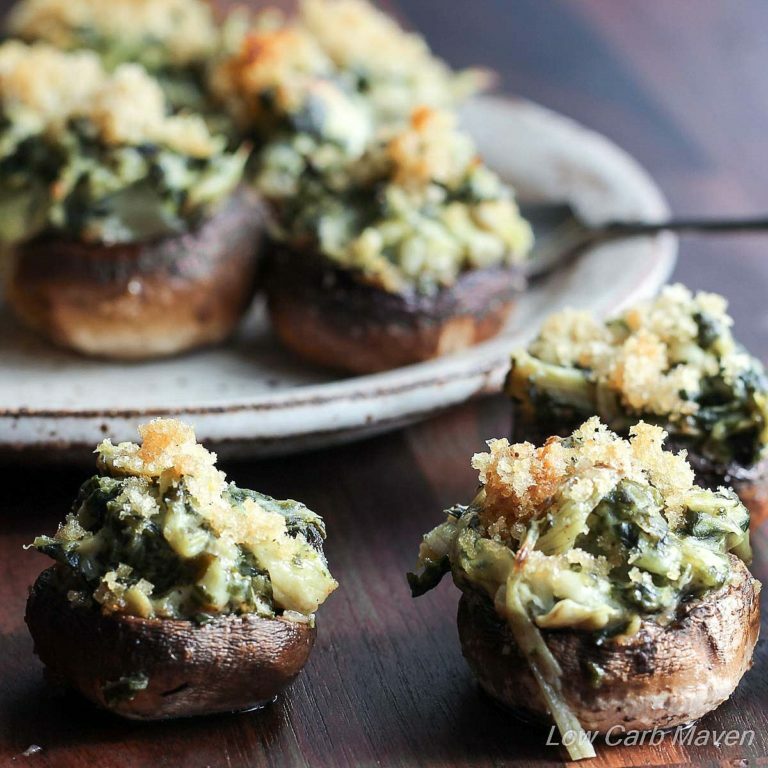 Spinach Artichoke Stuffed Mushrooms are easy to prepare, low carb, gluten-free and can be made days in advance of your gathering. Can a mushroom hater become a mushroom lover? I hope so because these little bite-sized stuffed morsels are mighty good! 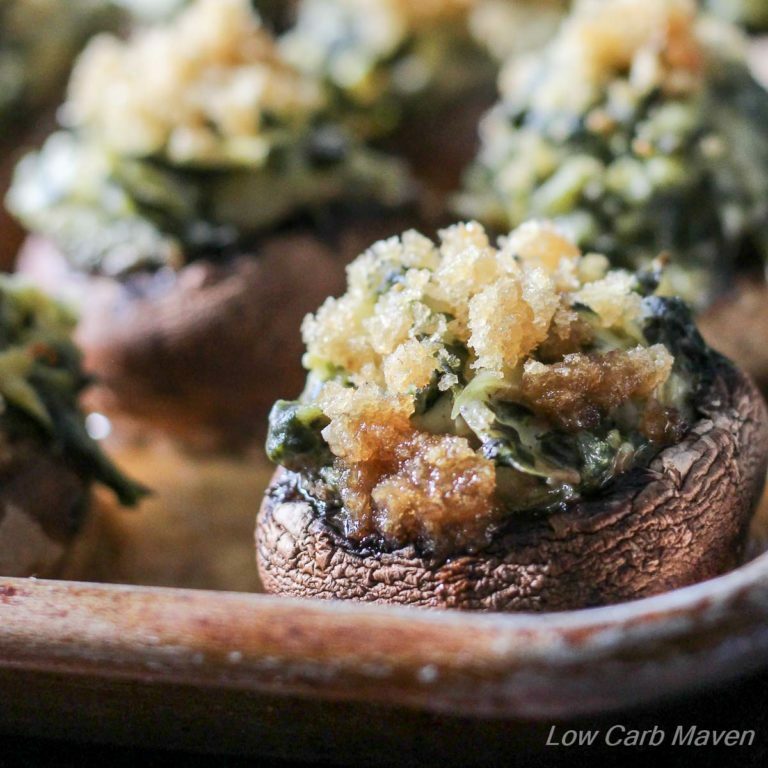 I love stuffed mushrooms and if you do too, you have to try these. They make the perfect savory bite. Well, perhaps two-bites! I think mushrooms are the perfect vehicle for the great low carb feta spinach artichoke dip that I posted the last week. The dip comes together in minutes on the stove and once stuffed, the mushrooms can wait in fridge for several days until needed. It doesn’t matter what kind of mushrooms you use as long as they are big enough for stuffing. I used a mixture of both white button mushrooms and crimini mushrooms or baby bellas. You’ll need 24 ounces of mushrooms which yields 30-36 appetizers depending on the size. After stuffing, I had some spinach artichoke dip left over which we ate with crackers and low carb bread… (and spoons). So. Good! When I posted that great low carb keto spinach artichoke dip last week, I promised I’d be using it in future recipes. These two-bite spinach artichoke stuffed mushrooms are one of those recipes. I’ll post the other in a few weeks. 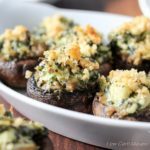 I think the next time I make this recipe for these spinach artichoke stuffed mushrooms I will use Portobellos and make a meal of it. Maybe I’ll add a little bacon, too, because I can. Don’t forget to pour chicken broth and/or wine into the pan before baking the stuffed mushrooms. It helps keep them moist and prevents them from excessive shrivel. No one likes super shriveled and dried out mushrooms. These Two-Bite Spinach Artichoke Stuffed Mushrooms are 2 net cars per piece. These Two-Bite Spinach Artichoke Stuffed Mushrooms are easy to prepare and can be made days in advance of your gathering. They are low carb, gluten-free, keto, and THM compliant. Mushrooms: Wash and dry the mushrooms. Twist and pull out all of the mushroom stems to save for another purpose or to discard. With a melon baller, scrape the gills out of the mushroom caps, making a nice well for the dip. Lay them on a sheet pan as you go. Prep: Mince the shallot and garlic. Squeeze the thawed spinach dry and chop well. Drain the canned artichoke hearts and chop. Saute: In a large frying pan over medium heat, saute the onion and garlic in the oil until softened. Add the cream cheese and heavy cream and whisk until the cream cheese is melted and creamy. Add: Add the sour cream, mayonnaise, Parmesan cheese, mozzarella cheese and feta cheese. Stir with the whisk until the mixture is melted and gently bubbling. Turn down the heat if you need to. Next, add the dry sherry. Stir and let the mixture gently bubble until the sharp smell of alcohol dissipates. Add the red wine vinegar and stir. Last: Fold and stir in the spinach and artichoke hearts and heat until warmed through. Stuff: Spoon the dip into each mushroom cap, mounding gently. If using the optional topping, mix the olive oil into the crushed pork rinds. 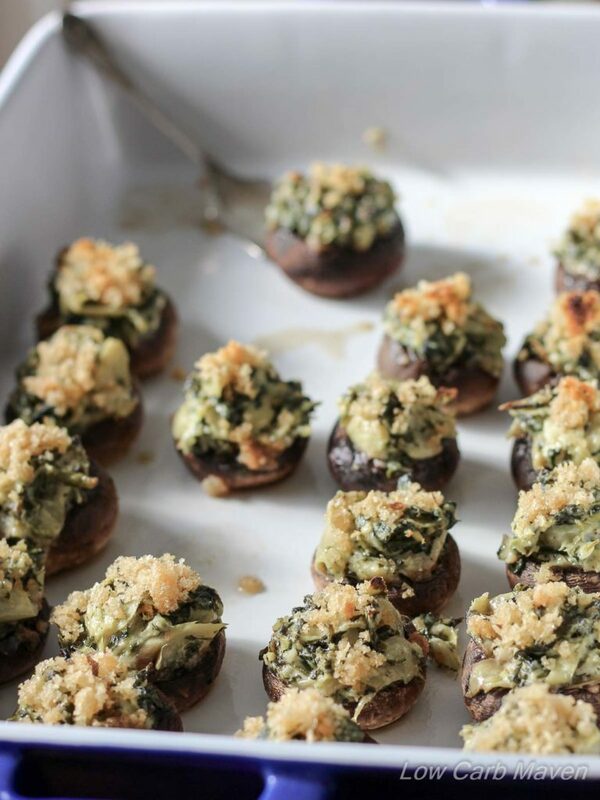 Sprinkle on each of the spinach artichoke stuffed mushrooms. Pour enough chicken broth into the sheet pan to cover the bottom. Bake in a 375 preheated oven for 15-20 minutes. Then place under the broiler to brown the topping. Make sure to watch very closely so the topping doesn't burn. If the Spinach Artichoke Stuffed Mushrooms have been in the refrigerator, bring them to room temperature for an hour before cooking. They may need to be baked a little longer. Test one of the mushrooms from the middle of the tray. If it is done, the rest will most likely be ready as well. Nutrition information per 1 stuffed mushroom. Ok looks great. Question: ingredients list says Artichoke, frozen. The recipe says canned artichoke hearts. I assume I should use the canned? Oh how I love this can’take Wait to try it .Where have been kim all my life lol. Appetizers? Heck, I’m thinking about this for dinner! I’m loving your collection of low-carb recipes. As a diabetic and (diabetic awareness) advocate, this is something near and dear to me. As a guy who loves to eat (the real reason I’m here), I’m so glad we found each other. Keep up the great work. Please. These stuffed mushrooms look amazing! Cant believe they are low-carb! I think I could eat ten in one siting lol! Can you clarify the serving size? At the beginning it says 30 mushrooms but in the nutrition facts it doesn’t say. The name of the recipe implies that two bites equal 3 carbs. Oh! I want to add that the recipe makes about 30 mushrooms with each mushroom being 2 net carbs. Each mushroom is about 2-bites.